The story takes place between Poseidon and Hades. Athena and their knights must fight against powerful giants who lives on mount Etna, in Italy. 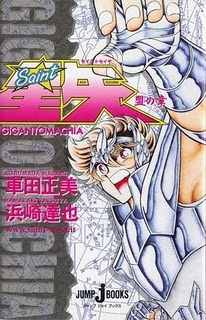 It is a unique work in Saint Seiya: simple, dynamic and well explained. If you are a fan of the franchise, you will appreciate the wealth of details and the very interesting information about the classic manga. I liked all the characters developed here: Mei, Typhon and Bronze Knights. Their personalities and skills duly explored throughout history. Deeper into Typhon, he possesses a distinct personality from the other gods, being very violent and most ghastly (something far removed from the coldness of Hades and Poseidon). Its focus is destruction and chaos. Mei, our protagonist, is more calm and balanced than Seiya (usually the main one).